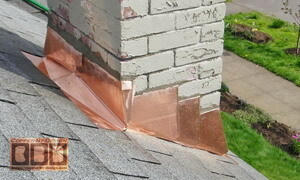 Clearly the #1 cause of roof failure is rusted steel roof flashing and improperly installed flashing, or lack there of. In my 20+ years experience from crawling up on several thousand roofs I've personally seen in most cases the Roofing Contractors will not re-flash many of these problem areas they were hired to fix in the first place, let alone flashed the right way. 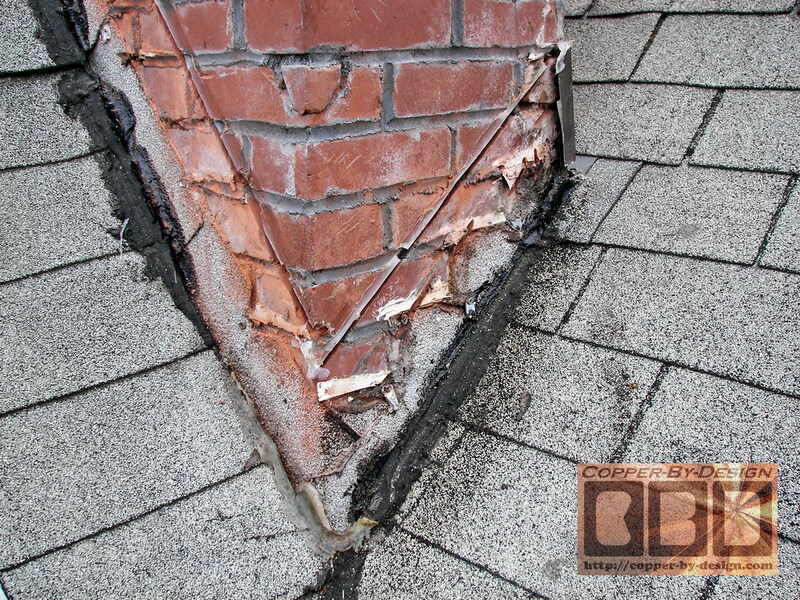 Homeowner very often cheated when the worse problem areas of their roof were not solved. I've done several tear-offs where I removed 2 layers of composite shingles and the bottom layer of wood shakes, where the only flashing I found around the dormer was under the wood shakes, and of course it was very rusty and deteriorated. 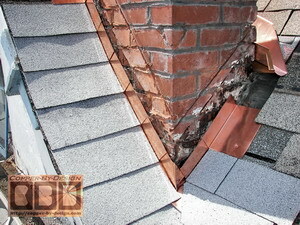 That means the last 2 reroofings they had done had not bother to reflash the dormers at all. 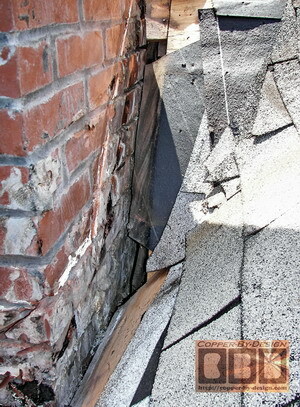 I have yet to see evidence of a decent roofer in this area. No joke. 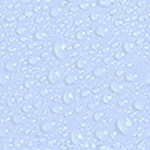 One of the problems stem from these workers come more from a hammer and nail mind-set. Not from a sheet metal worker's perspective like me, so these area of roofing escapes their private logic. 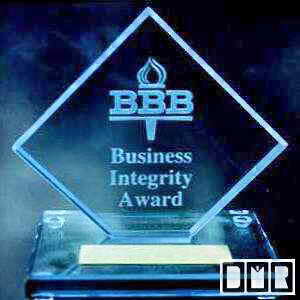 Sadly ethical responsibility seems to be a thing of the past. 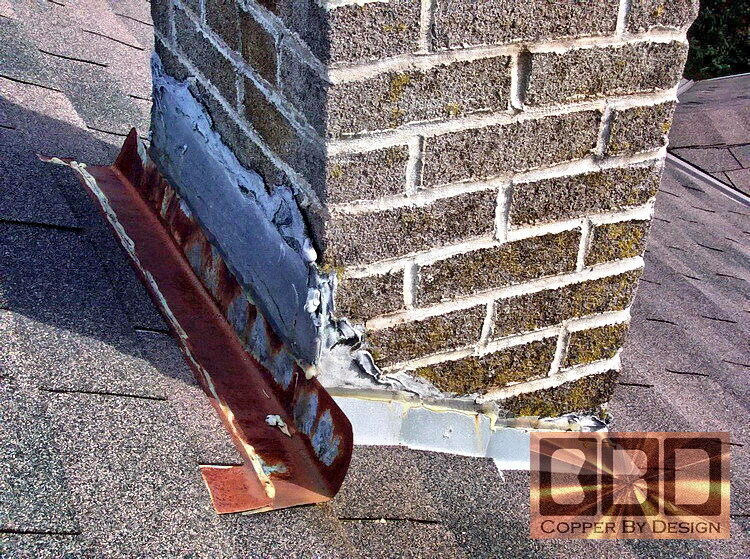 I understand this is not just a local issue either, Improper roof flashing using just cheap steel is the standard across the Country. This thin steel flashing will not even last as long as the most inexpensive 20 year roofing shingles. 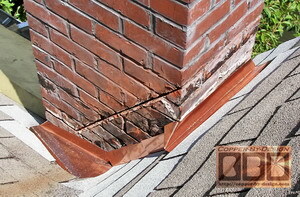 Even if it does not rust all the way through it will cause unsightly rust stains down the roofing. 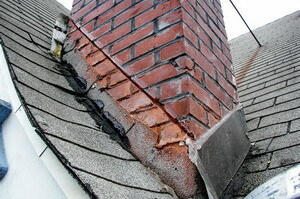 From what I have seen chimney flashing is the most neglected area of the roof, if re-flashed at all. More times than not it was never re-flashed during the last re-roof. I have personally seen thousands of examples of this close-up. In most cases they will just bend the old counter-flashing out and slip the new step-flashing under and just bend that rusty counter-flashing back down over it. 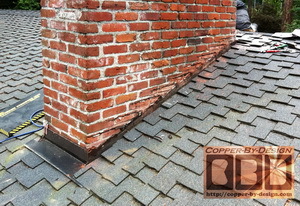 Even if it were not rusty at all it is not going to last through the life of the new roof. 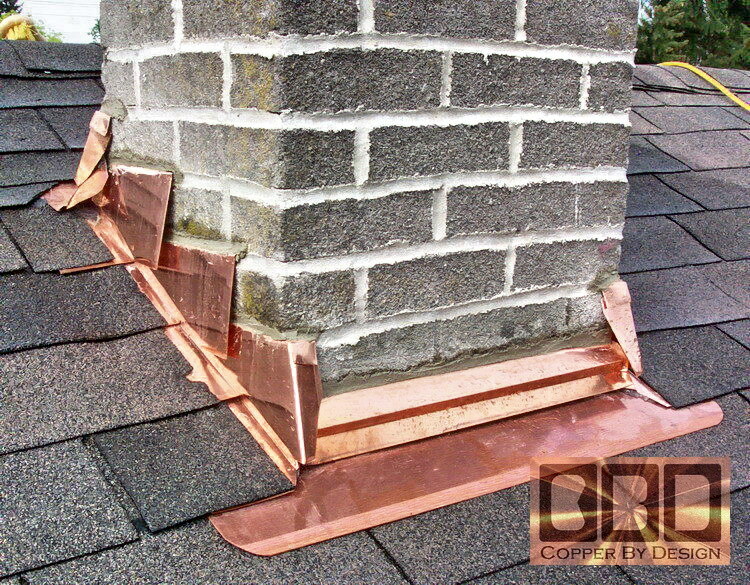 Even though they were not willing to replace the old flashing they are not likely to bother notifying you the Homeowner of these rust issues that still need fixed, so you don't have a clue that the roofing job was never finished until you notice a leak, which means damage has already occurred. 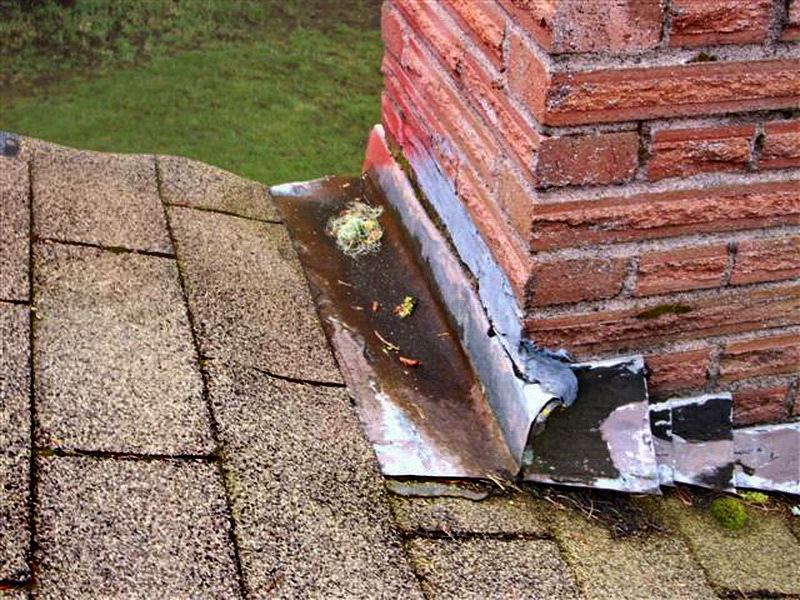 Worse yet is how many homeowners are conned into paying to fully re-roofing their house because of these flashing leaks, instead of just replacing that flashing. 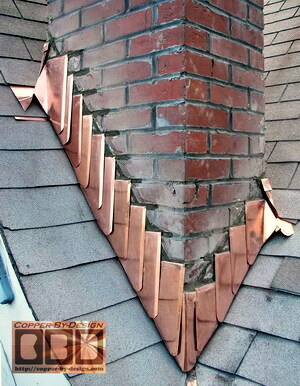 These fancy talking salesman are much more motivated to sell a whole re-roofing package to unsuspecting Homeowners to make that big ticket sale, where in most cases even if they do actually replace that flashing they again will do this new work without the benefit of using rust-free metal like aluminum or copper. 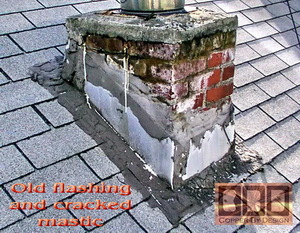 In many cases not even bothering to re-flash the problem areas as they had promised, and failing to solve the actual problem. 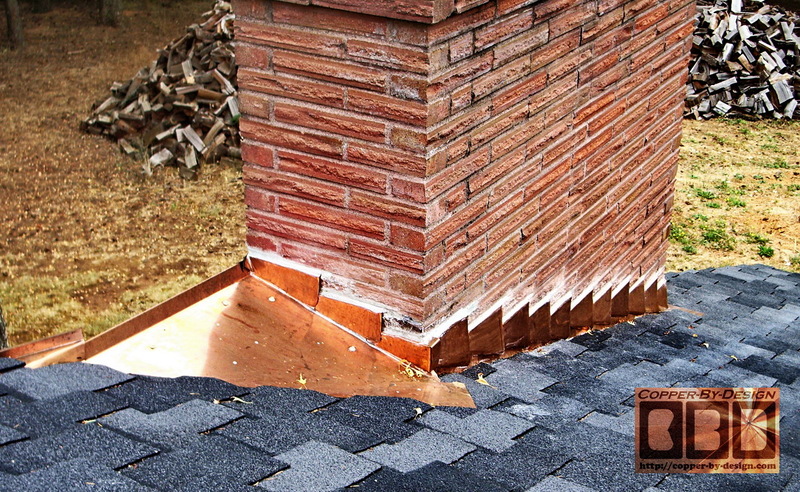 This is one of the main reasons liability insurance for roofers is very hard to get and extremely costly these days, being around 500% more than any other type of construction work. That is very telling in it's self demonstrating irrefutable proof of what I'm saying here. 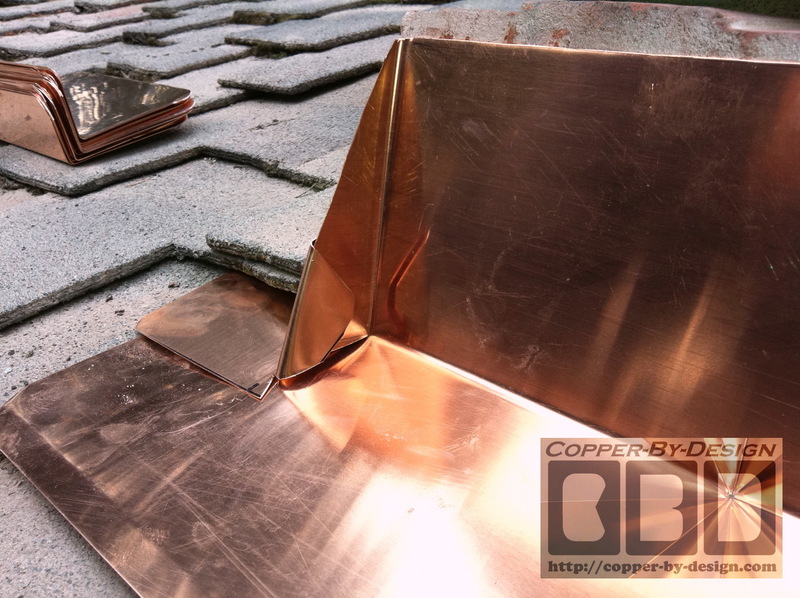 Most of roof flashing can be replaced without re-roofing the whole house (as seen above), but of course that is far less profitable for a Roofing Contractor, so that is rarely offered as an option for your consideration. 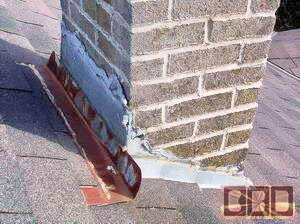 These roofers know better, but they still do the same kind of roofing with this cheap steel flashing that they just tore off of your house. They know will fail in short order, but they just don't care. It is said how this is the definition of insanity: doing the same thing and expecting different results. 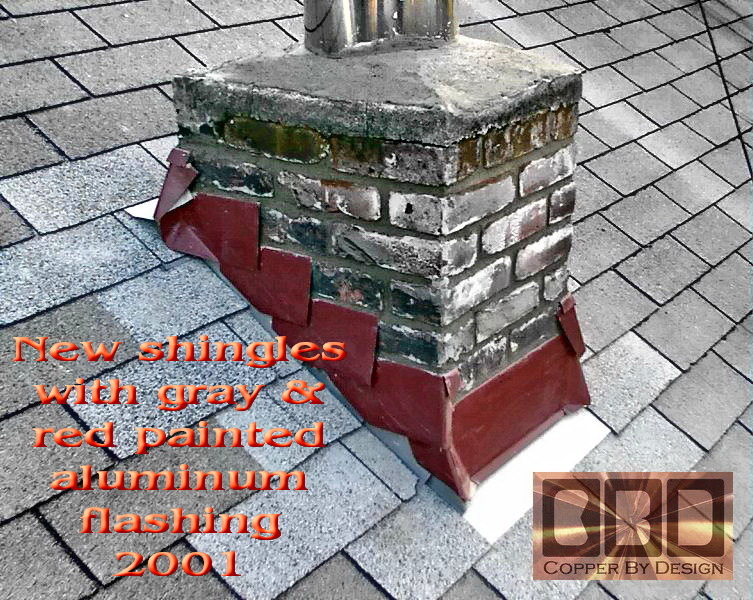 Sadder yet is how they are only saving around $200 on the average reroofing by not using aluminum that is about twice as thick and will not rust even if all the paint were to flake off decades later, still protecting your roof. 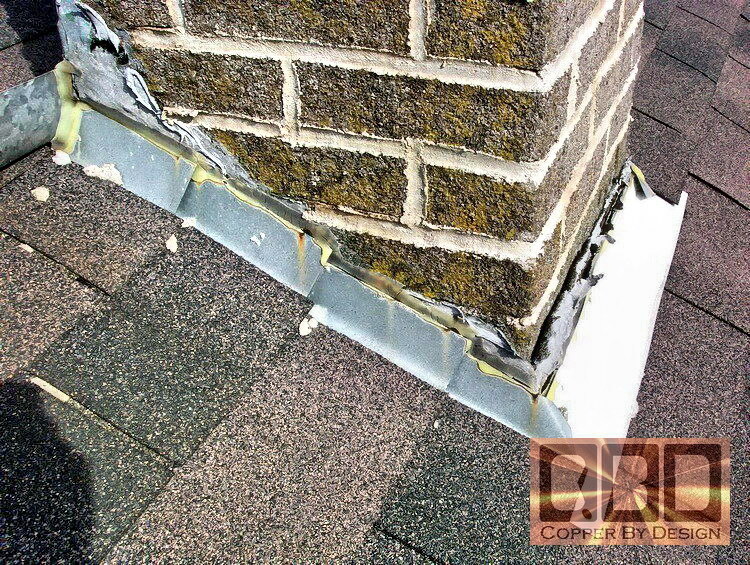 We know this to be a very common intentional crime of Roofing Contractors, since pretty much any roofer has seen the evidence of these common issues when doing a tear-off of an old roof; i.e. 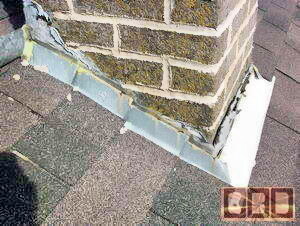 very rusty steel flashing on the roof and mastic failure. 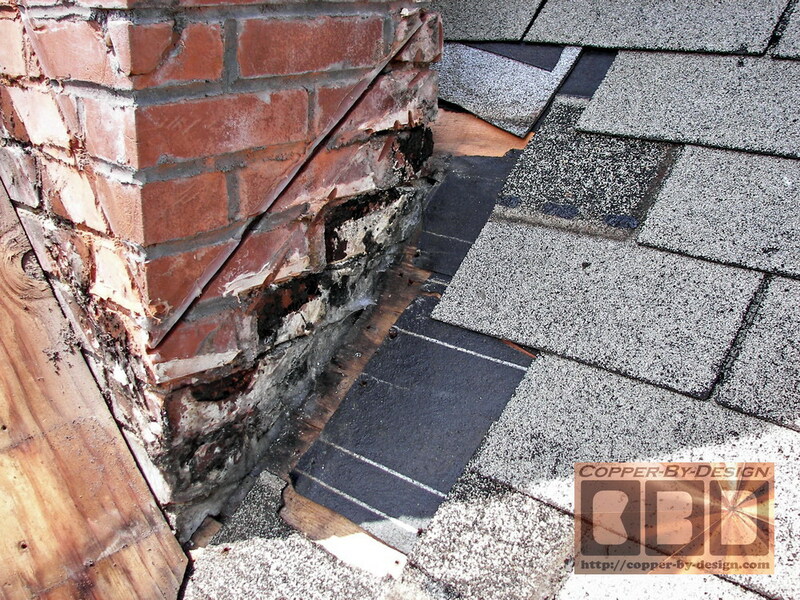 When they tear into a bad roof for replacement it tells a story of why this roof failed. They would have to be complete morons to not see this clear evidence in front of their eyes. 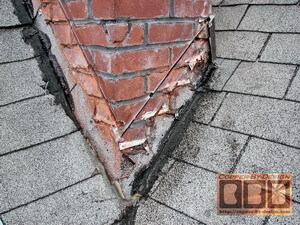 Yet, they continue to ignore this evidence and do the same shoddy work, since in most cases they are not required to file for a building permit to replace your roof year after year, and have not had to worry about an inspector double checking their work. 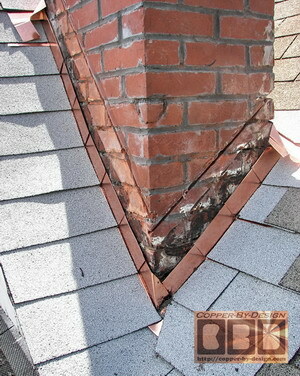 Some clients have asked about using lead for this chimney flashing. It is some times use as the chimney is being first built, but I do not know how you could be able to get it in if the mortar when the more rigid thinner copper flashing is this difficult to quickly install before the mortar sets. I do not believe it's very good for the environment as well. 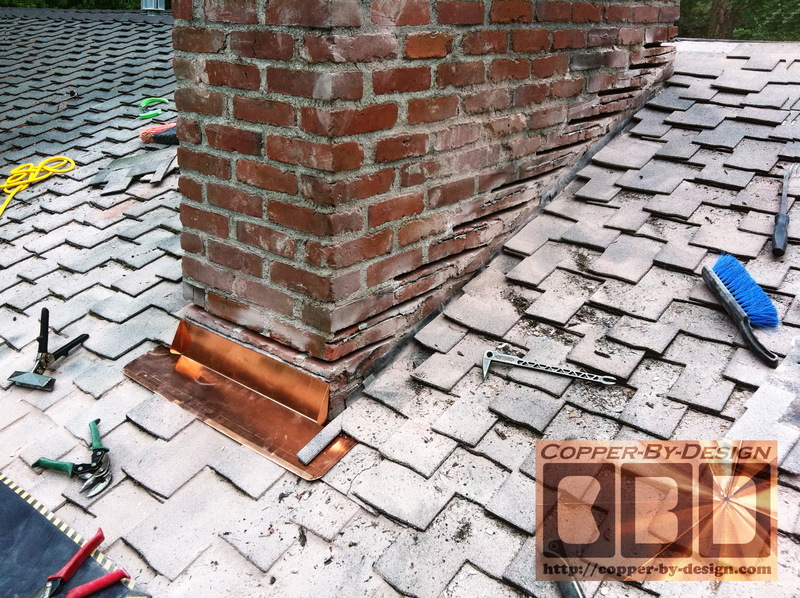 The most common mistake I see roofers do when they do bother to re-flash a chimney is to cut a shallow grove along the diagonal sides of the chimney to caulk a straight piece of flashing in, but these will not remain attached for long to the crumbly bricks and old mortar. 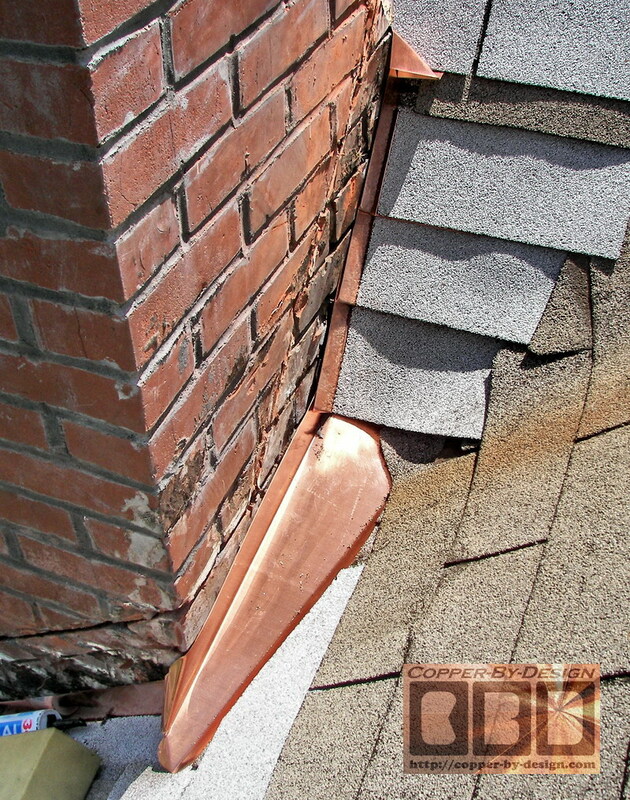 Although that is not the worst problem; this sets up a fracture point for the chimney to crack and possible collapse in an Earth tremor. I have seen lots of evidence of this happening. 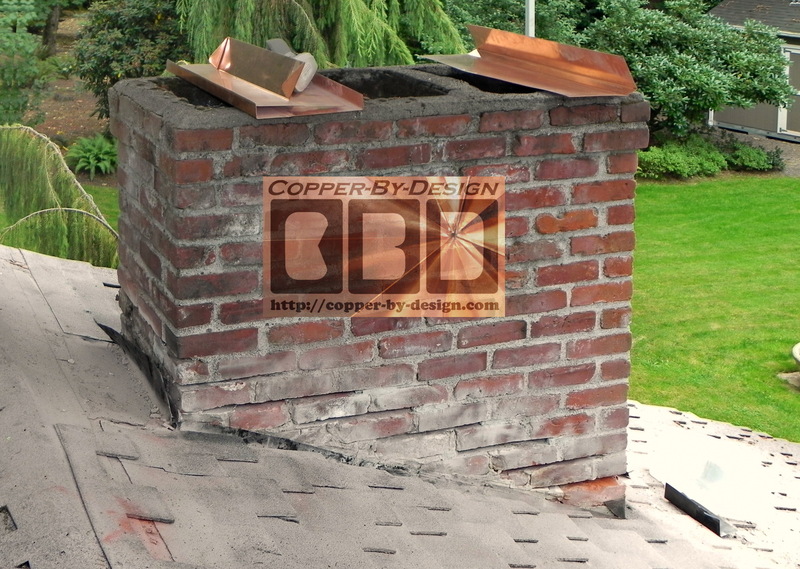 So, keep in mind how if they do this to your chimney they have permanently damaged the chimney, where the only solution would be to rebuild the chimney down to the roof line with new bricks. 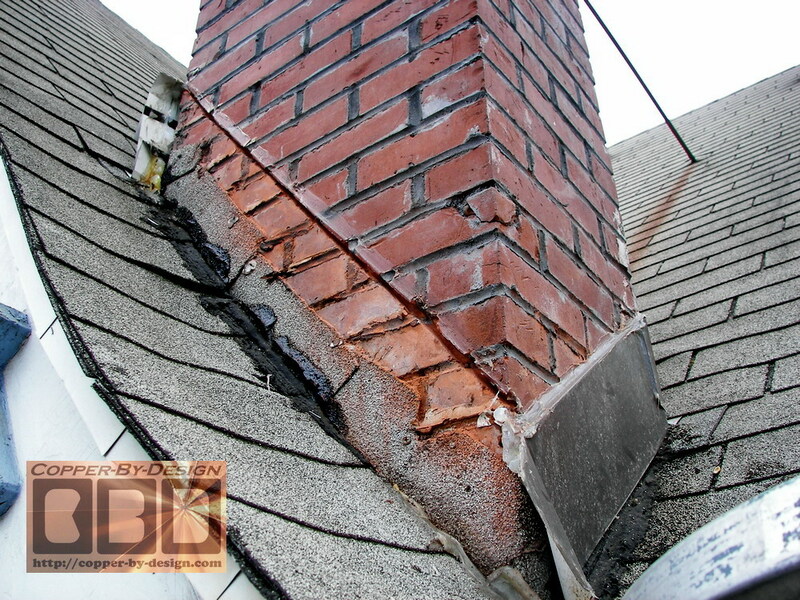 If this has not yet been done to your chimney, you need to warn your roofer that you will require them to rebuild your chimney if they do this. 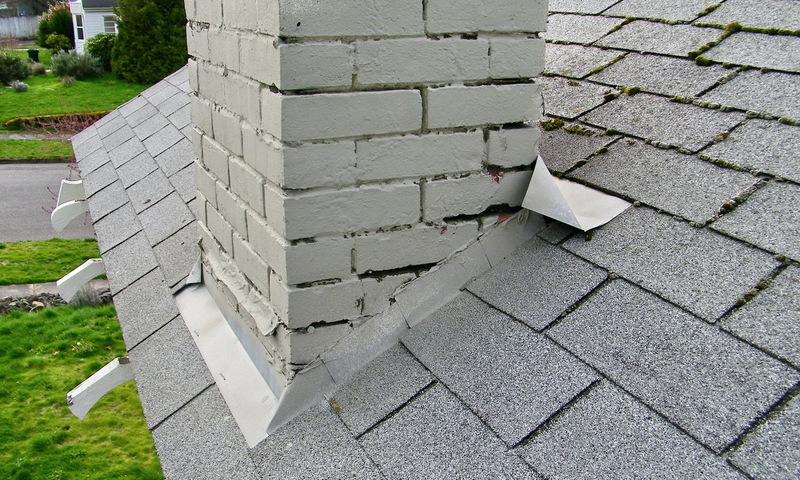 Even high quality silicone caulk should never be used to attach counter-flashing, because it is just rubbery and adds no structural strength to your compromised chimney. 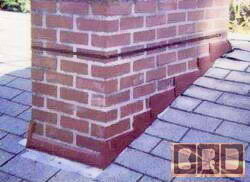 Just as with the useless effort of tuck-pointing a chimney to make the mortar grooves look nice again; the new granulated caulk in such a shallow groove has only the old crumbling mortar to stick to, so it will simply fall out within a few years. 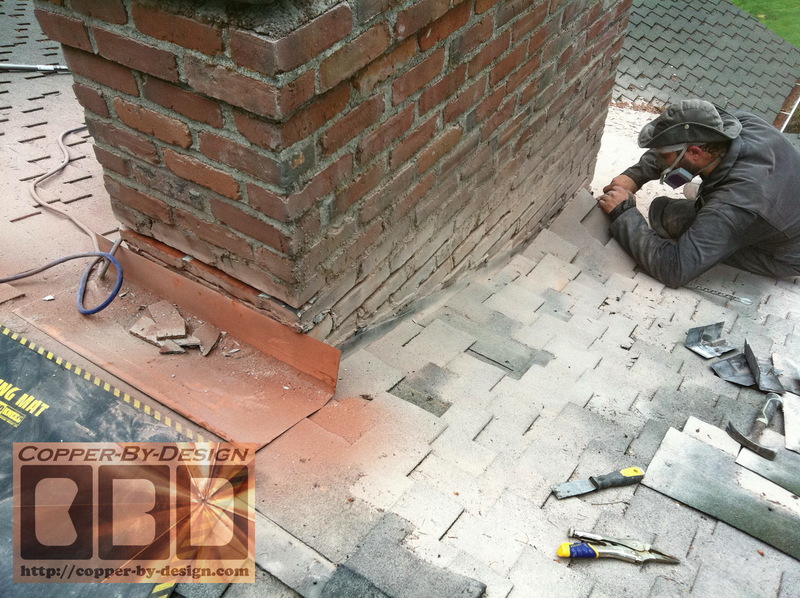 These groves need to be ground out a lot deeper than just 1/2" in order to have the upper and lower brick surface to adhere to, and only be filled back in with real mortar. 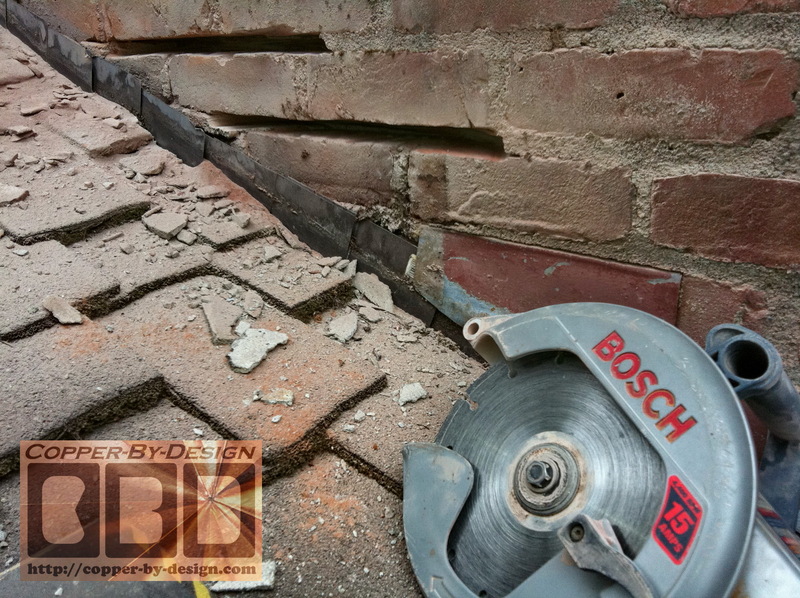 The groove needs to be at least 1.5" to 2" deep. Anything short of that is a waste of time and money. Yes, I seem to be the only shop willing to spend the time to work with Homeowners through e-mail to figure out these custom kits for them or their local installer to use. 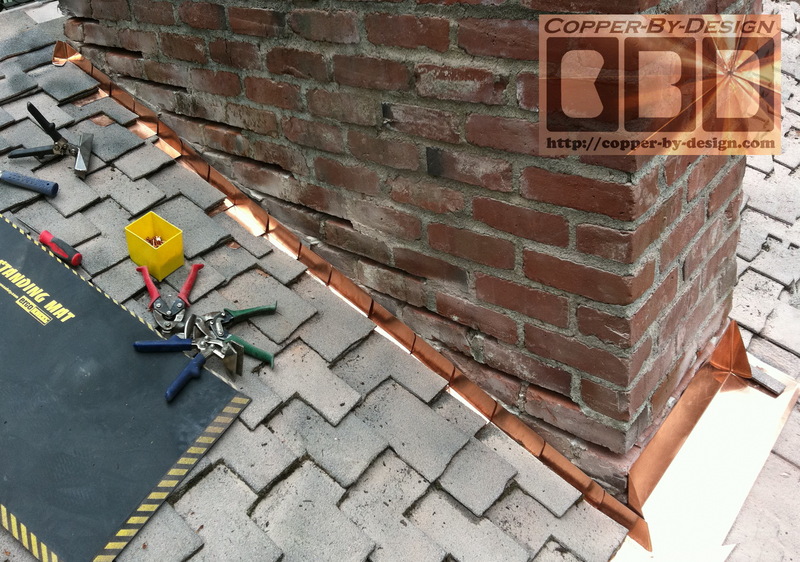 They are labeled and numbered in order of installation, and precut and bent to minimize customization needed at the job site. 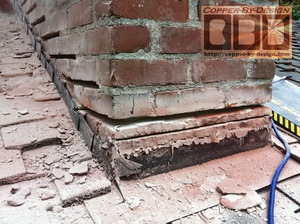 Below is some instruction and detailed photos to help give you a good idea of how to do this propperly. 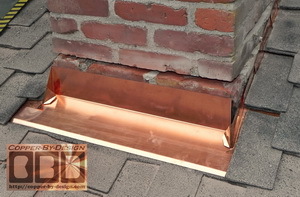 As you can see from our web site I can also help with many other custom flashing needs. 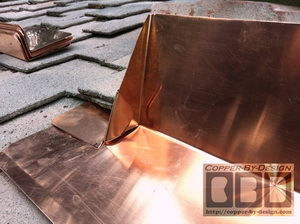 Although you may need to consider the physical contact of the copper flashing with steel pipes and the detrimental effect it will have on the steel through electrolysis. The steel will not harm the copper, but the copper will accelerate the deterioration of the steel. 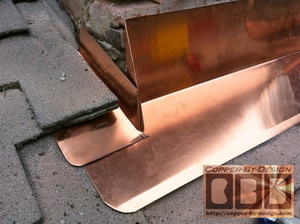 Stainless steel is compatible with copper. This chimney pipe for the wood stove in my wood shop corroded within a year and became unusable. 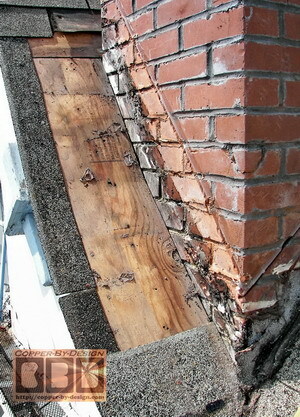 If you are are a victim of this all too common unethical business practice you can show your Contractor this web site. 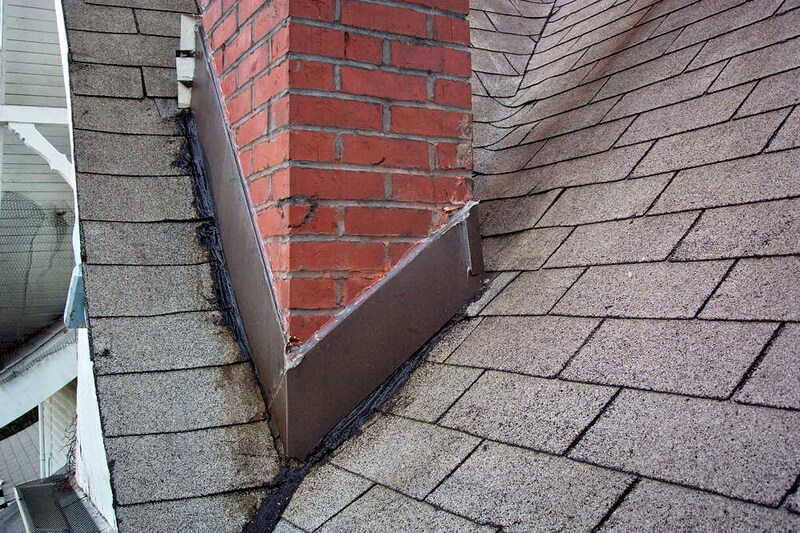 Then you should be able to deduct the cost of repairing your chimney and it's flashing even if you are going to do it yourself, plus the cost of cleaning off that black tar. 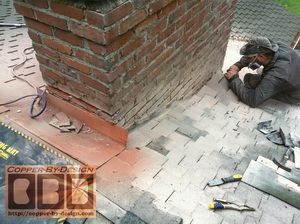 I would encourage you to insist he has that tar removed and cleaned off by his workers as if it were never there. That ought to teach him a lesson. It is messy work and solvents on the roofing will damage the shingles and cause a terrible staining mess. 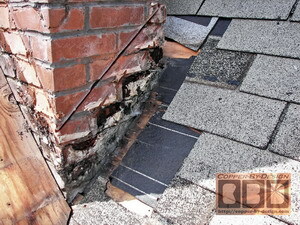 If the contractor uses a solvent he'll then need to replace all the damaged and stained shingles at the same time. Do not let them talk you into any other alternative, trying to minimize their damage. They will try to discredit me and say I do not know what I am talking about, but it is simple logic they cannot BS their way out of if you stand your ground. 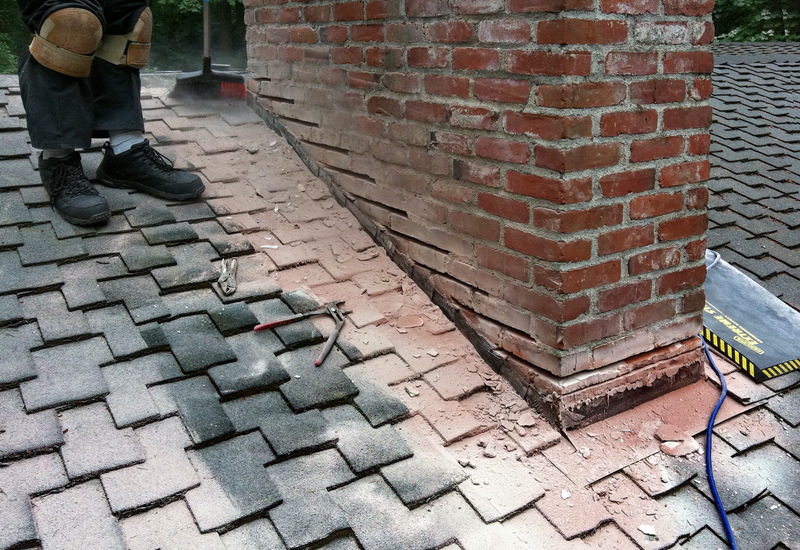 Roofers will claim that it can only be done this way when the chimney was first built by the brick mason, but I prove here that is simply not true. 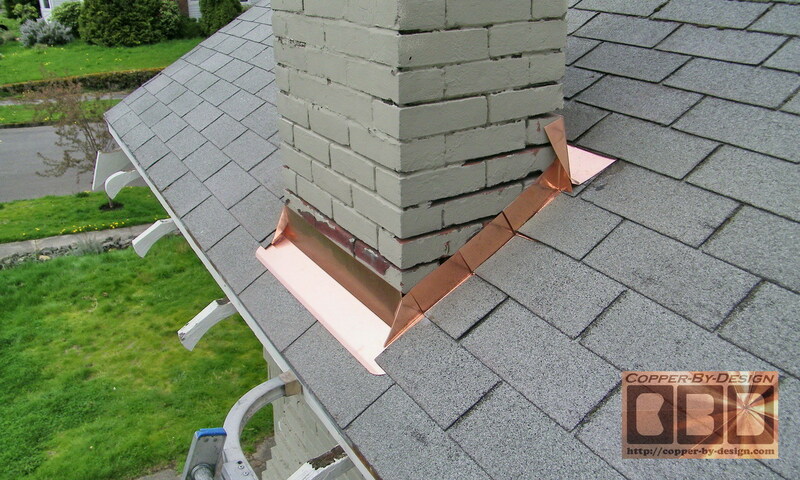 Here is a step-by-step chimney re-flashing job I was hired to do along with the gutters on this rental house back in April of 2004 for a client Named Toni Ferro located at 3953 S. E. Grant Street in Portland, Oregon. 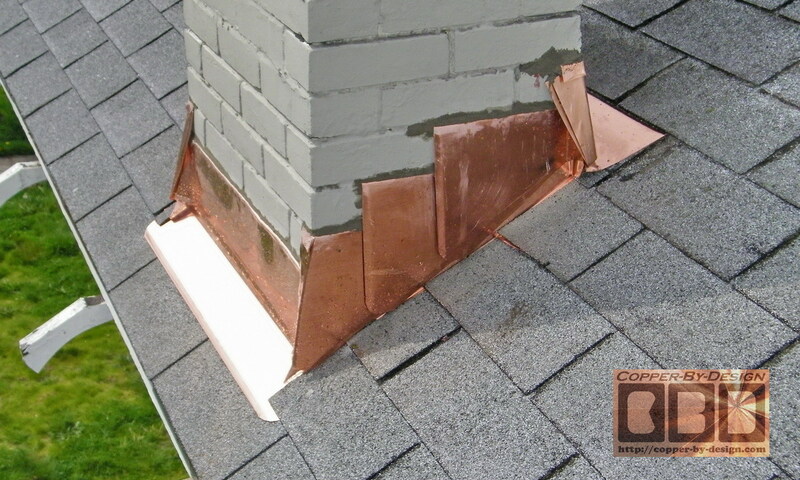 When I was replacing the gutters on the house, I noticed that the two chimneys were not flashed correctly and must be leaking into the house. 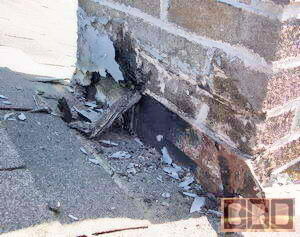 As you can see here the caulk they had used to try and seal the step-flashing to the bricks is not only peeling off and cracking from Sun exposure, but it could not have lasted even a year with even a slight difference of expansion and contraction between the wood structure of the house and the clay of the brick chimney that extend from the dirt floor up to the roof. 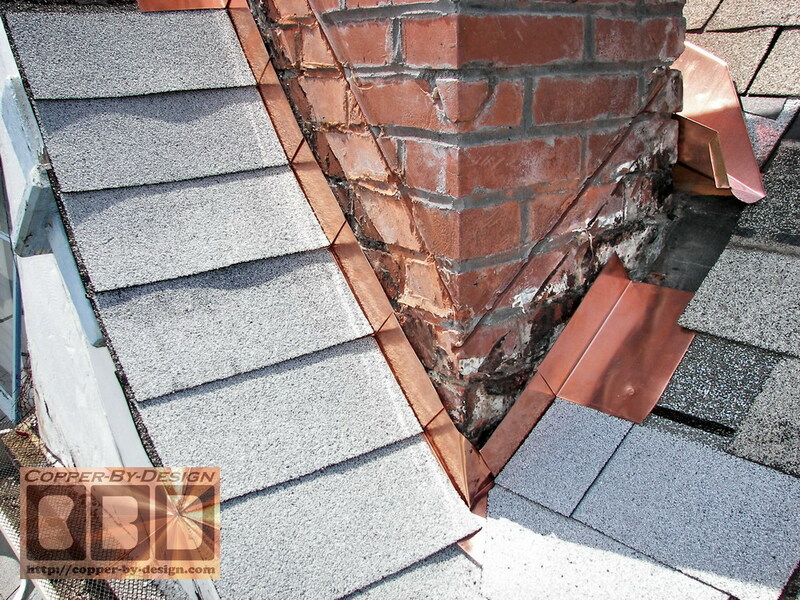 Due to temperature changes it would break apart any sealer. There was no counter-flashing to be seen here at all. 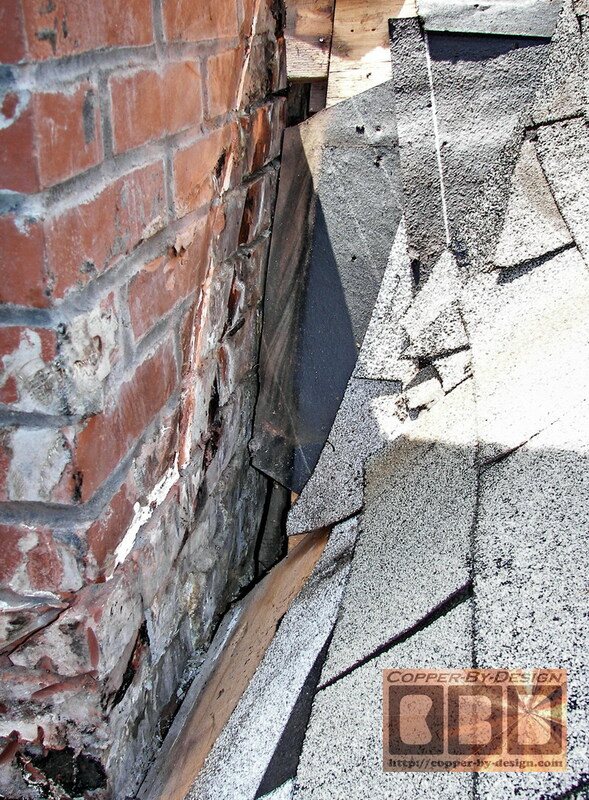 I took a few digital photos of the chimney flashing to send to the Landlord through e-mail to advise her of this problem and go over different options to solve these issues. Besides the failing caulk, you can see the flashing is rusty and would not have lasted much longer, but the most serious problem is the missing counter-flashing. 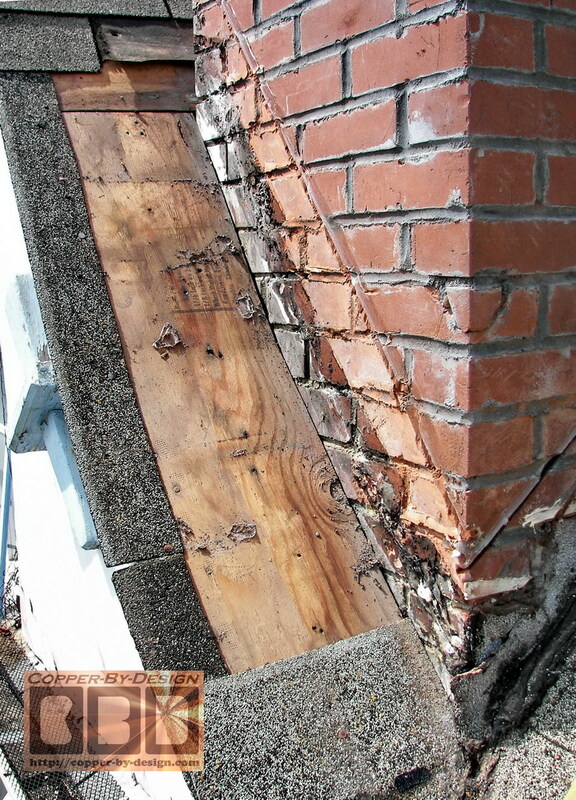 She saw the wisdom of re-flashing it as soon as possible and mailed in a half down deposit to schedule this in. I was just contracted to replace the old rusty gutters with new aluminum gutters, but while removing the old gutters I got a closer look at the horrible chimney flashing job they just had done. This brown painted steel counter-flashing may look nice and clean, but it is just a good example of atrocious flashing work. Let me explain. 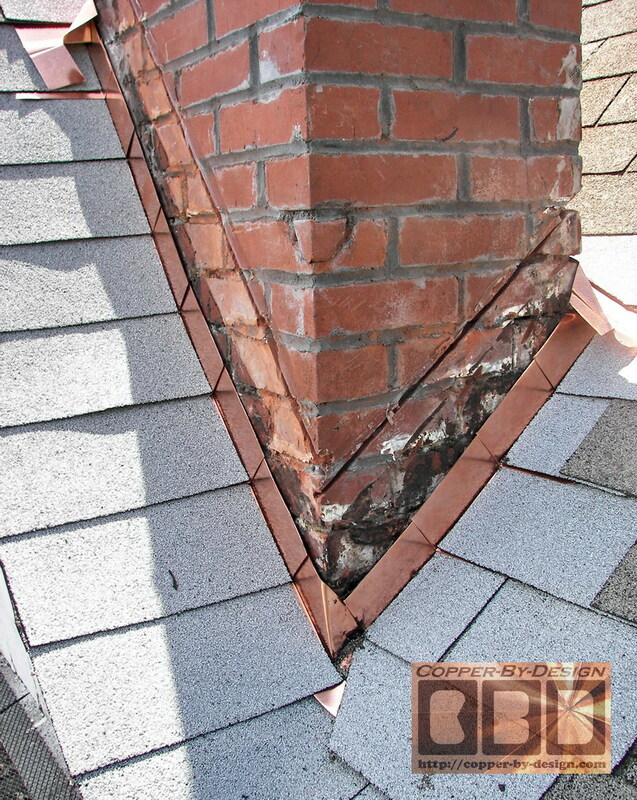 Beside the issue of leaks and dry-rot, which is plenty important, when they cut a diagonal line like this through the bricks they have damaged their chimney and set a fracture point. 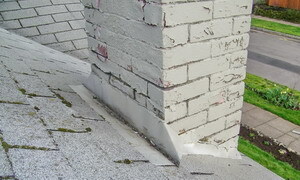 This will crack during an earthquake, which had caused thousands of chimneys to come crushing down in this area back in 1993, which had smashed cars parked below, and lots of other damage. 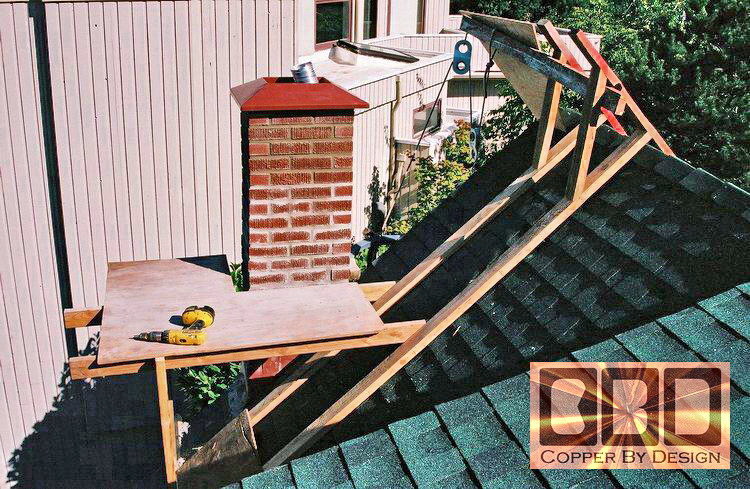 That rusty pipe brace will not stop it. 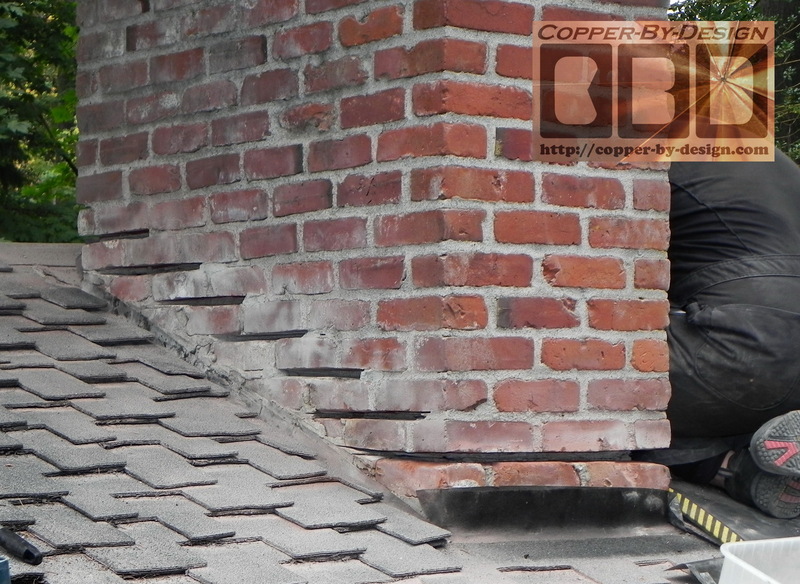 There is over a 2 tons of bricks over this roof line. 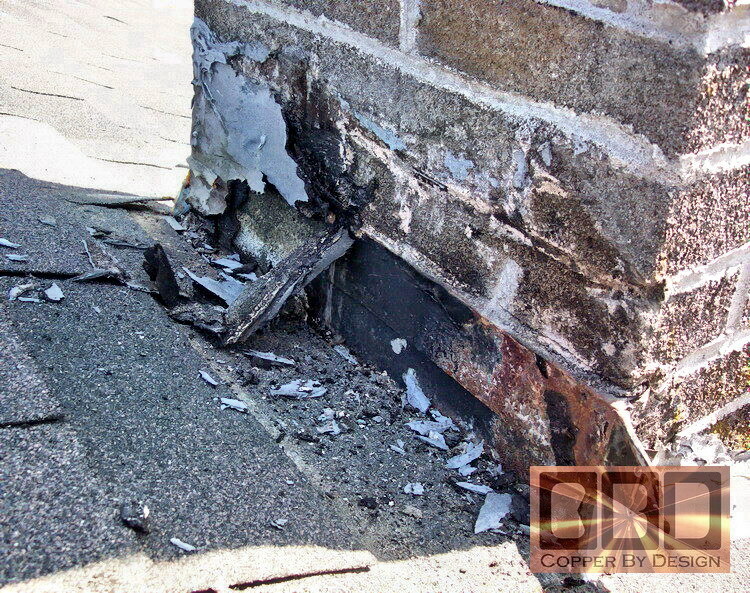 How much damage do you think that could cause? 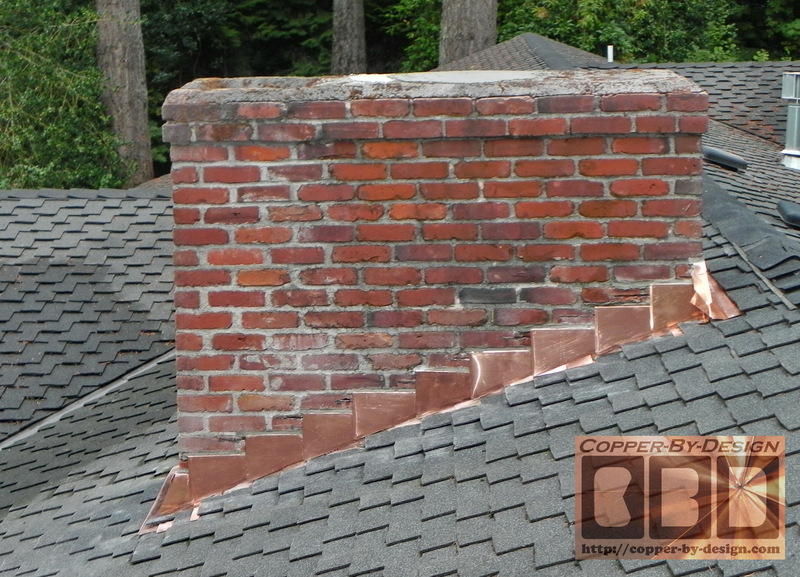 These clients were not in a financial position to have the whole chimney rebuilt from the roof line up, so I did what I could to salvage this mess. 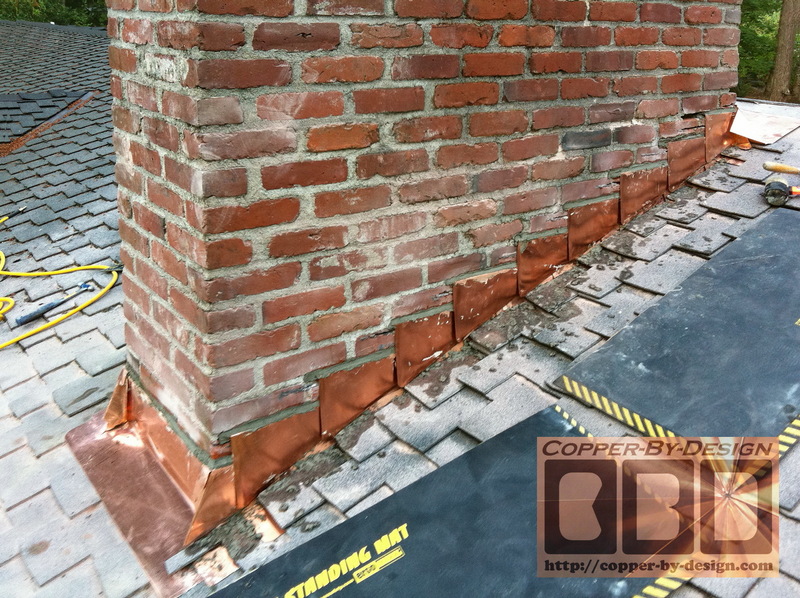 It was surprising how easily the caulk came off the bricks when I pulled these flat steel panels off the sides. It clearly would not have lasted very long. Even a strong wind storm could have ripped them off. I then found out how the roofer had not bothered to even step-flash around this chimney. I stripped it down and scraped off the tar they had used to seal the roofing to the bricks. 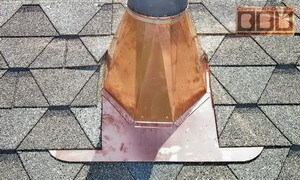 It was quite an ugly mess, but I did the best I could up on top of a 2 story high ladder leaning over this steep roof. 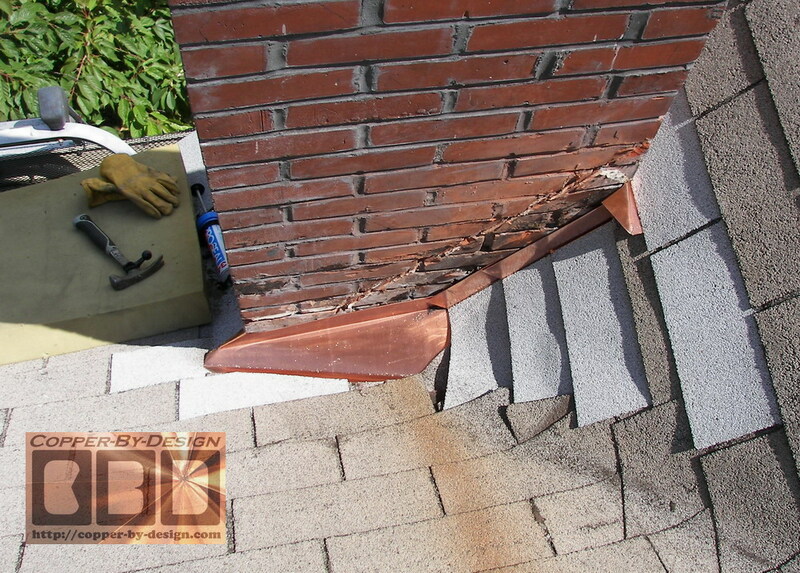 The shingles on this side had to be completely replaced with new felt paper and shingles before I could start to attach the new step-flashing pieces. 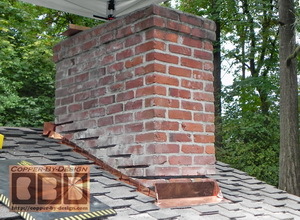 As you can see in the right photo this chimney placement was not planned very well. 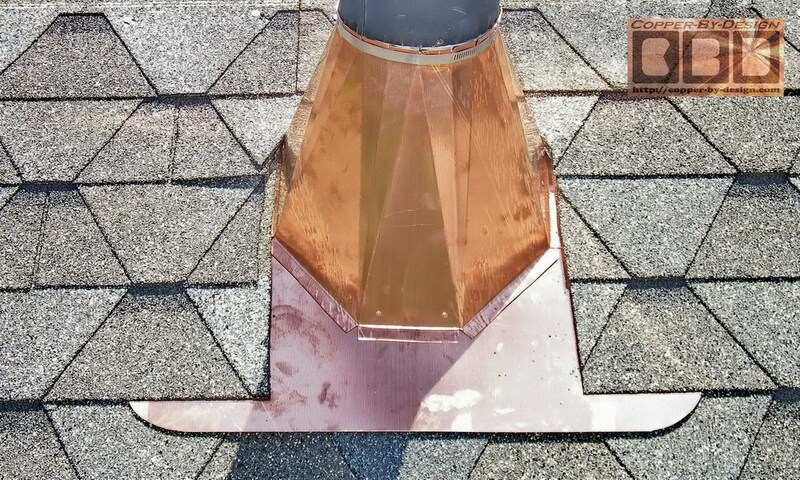 It was set right at the base of this roof valley. It had collect a great deal of debris below this 15' long valley above. 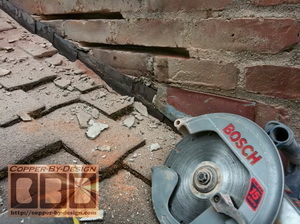 It was very hard to get my grinder in this area to cut the groves for the new counter-flashing. 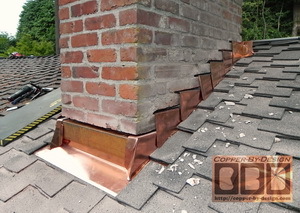 Heck, it was a challenge to just get my hammer and crow bar in there just to remove the nails holding the old shingles down. I should have charged them twice what I had quoted for all the trouble I ran into. 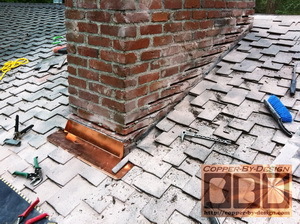 These shots show the new shingles and copper step-flashing in place. 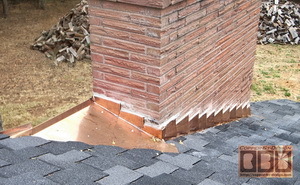 You can see here how I made a special custom tapered pan at the base of the valley to help channel the water and debris off to the side of the chimney. 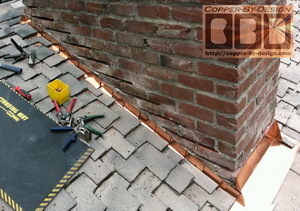 I did my best to fill in the diagonal cut with mortar and cover most of it with the new copper counter-flashing pieces. 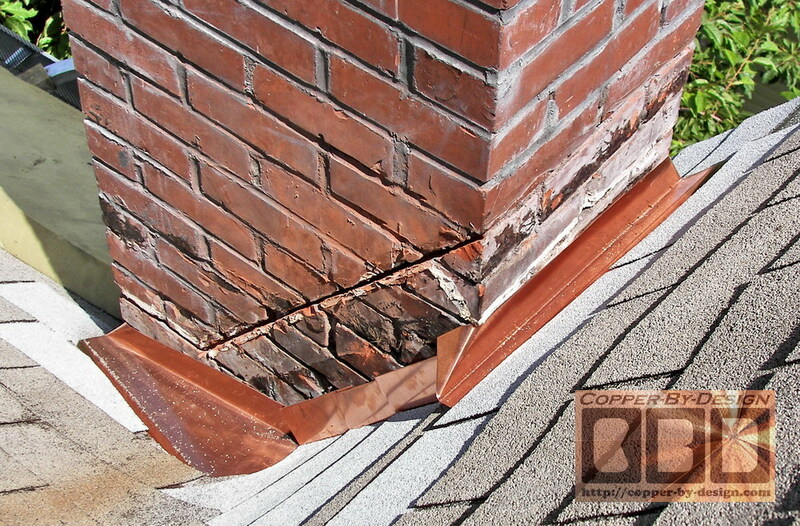 This may not look as smooth as the other steel flashing was, but it is a huge improvement functionally speaking. 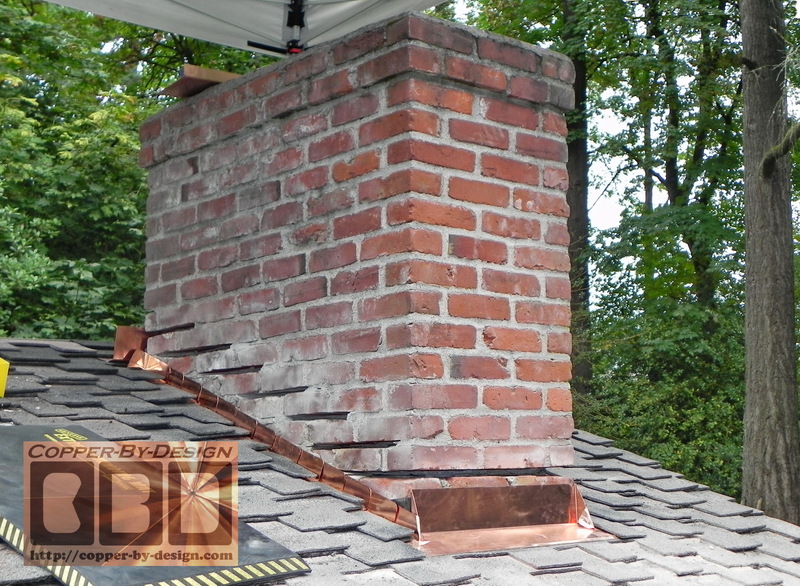 They were pleased with the work I did at a lower cost than the other chimney flashing. 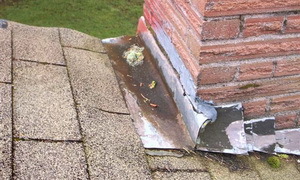 The later had me replace the gutters on a rental they owned. 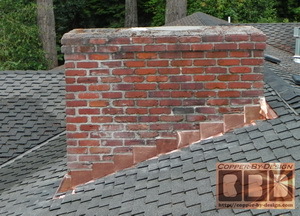 This was for a local client at 2505 N. E. Jarrett St, Portland, Oregon. 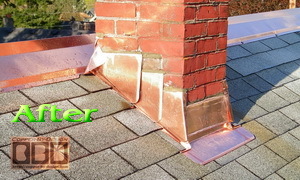 I was contracted to replace the old aluminum gutters with new copper gutters and a roof cleaning w/copper ridge caps. 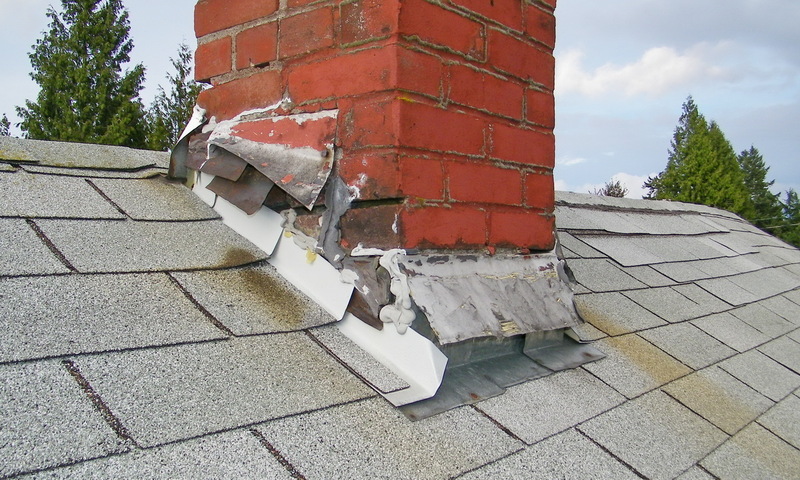 While up there working I got a closer look at the chimney flashing and shared photos I got with this clients advising they get both chimneys re-flashed. Naturally they asked if I could take care of it. These shots again show terrible flashing work. 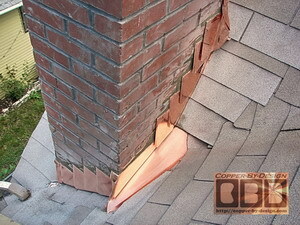 The chimney below also was missing the counter-flashing. 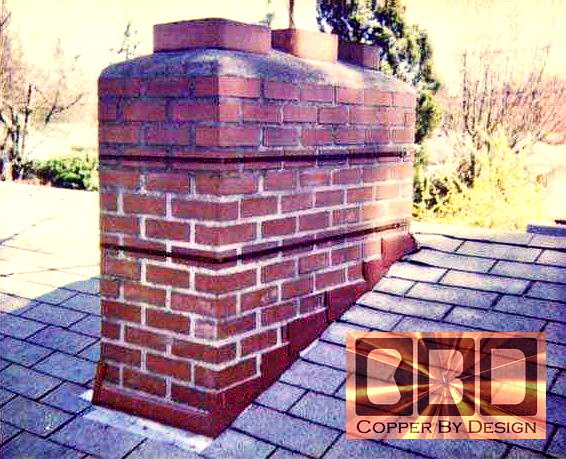 I just made a minor tapered cricket or saddle for the upper side of this chimney to help divert the water and debris off to the sides, but it should have had a full cricket that matched their 6/12 roof pitch, but I had added this detail at my own expense after I had bid this work w/o a cricket. 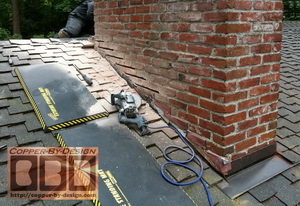 I didn't want to bother this client with any more expensive repair costs, as this whole project was already over $10k. 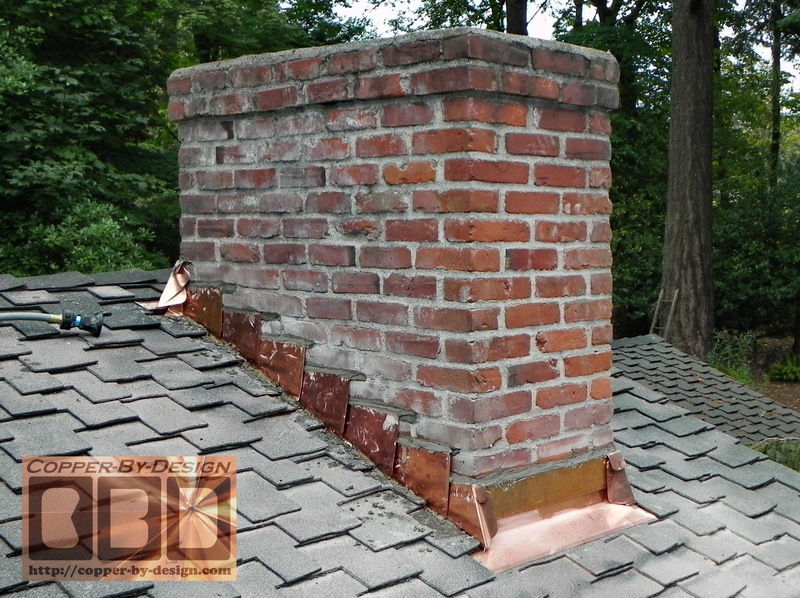 I rebuilt this chimney from the roof line up with all new bricks and clay red painted aluminum counter-flashing. 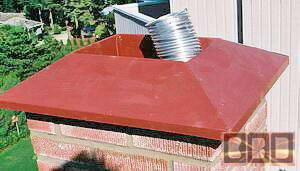 I thought it looked a lot better than the galvanized or brown painted steel that most roofers use (if they use anything at all). 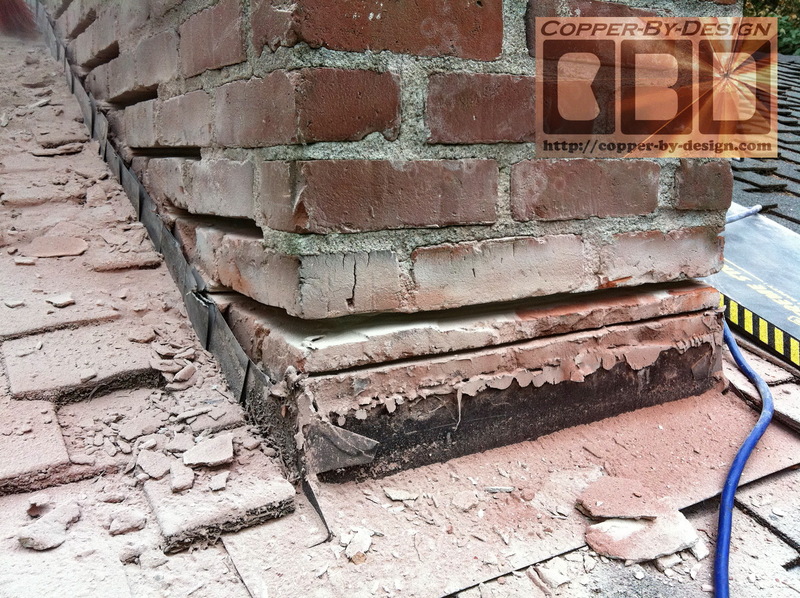 The mortar was so crumbly that I was able to lift the bricks off with my bare hands. 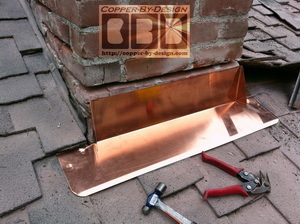 Now days I would only use copper flashing. 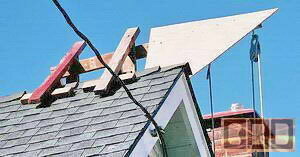 The black strap is to hold the television antenna up. This is on a house in West Linn on Rosemont and Suncrest. 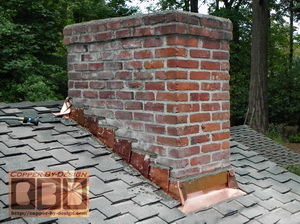 Tia and I also replaced the gutters and rebuilt this chimney from the roof line on up. 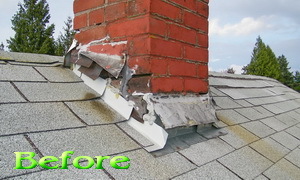 We later did the gutters on the house in the back ground as well. 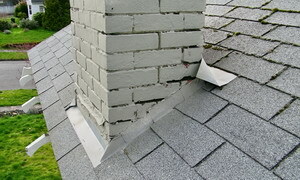 It is important to make sure the top of the chimney is at least 2 feet higher than any thing flammable that is 10 feet or less away. 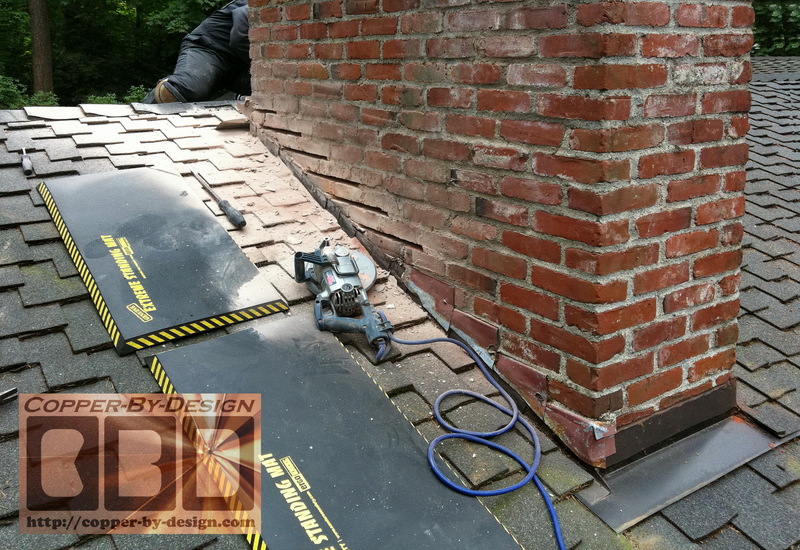 It is common that we have to build a special custom scaffold platform to work on that is strong enough to hold the weight of a worker, tools, bricks and a 5 gallon bucket of mortar. 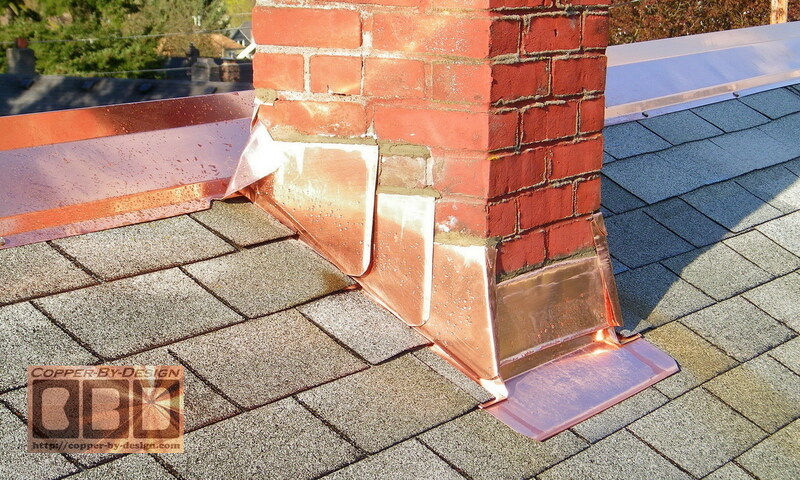 It also needs to sit gently on the roofing shingles to protect them. 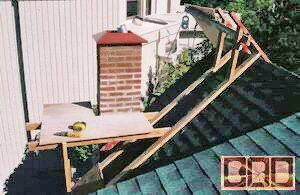 Sometimes this platform construction is half the work. 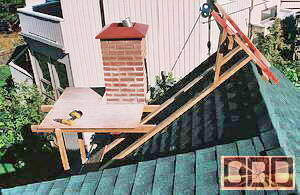 There is also a braced arm sticking out to the side with a rope and pulleys to hoist up buckets full of bricks and just mixed mortar. 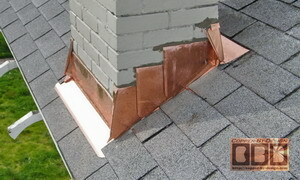 The whole assembly is custom fit and screwed together for easy removal when we are done. 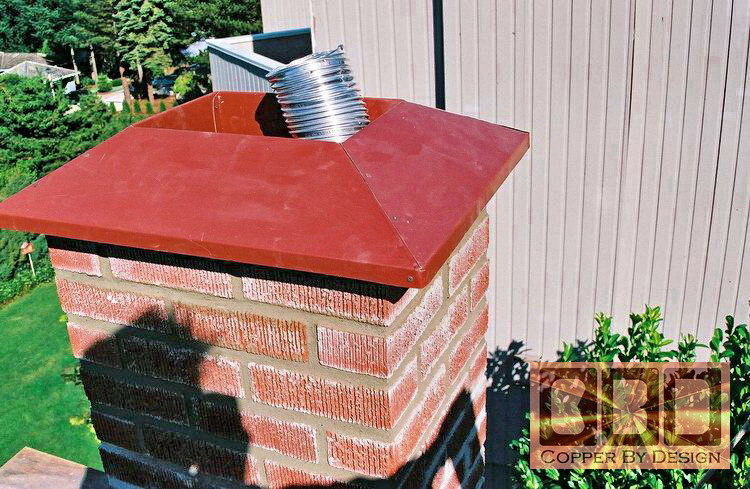 For this top cover, the cement is formed near the shape of the cap, and then the cap is pressed and tapped onto it for a tight fit, so the cement fills into each crevice of the cover. 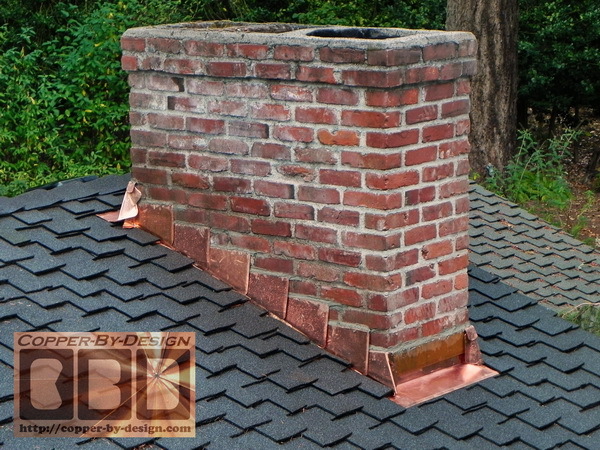 It also has the advantage of giving the chimney a real working drip edge. 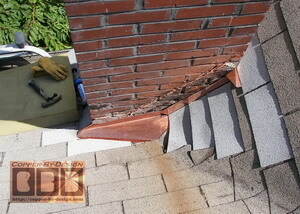 It has galvanized screws pressed into holes drilled into the center section, and driven into the cement. 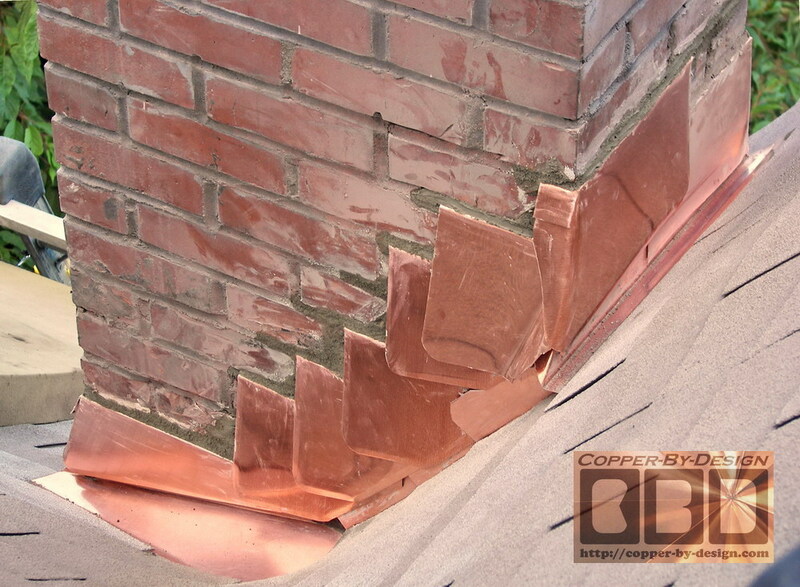 This way the cap cannot blow off in high wind. 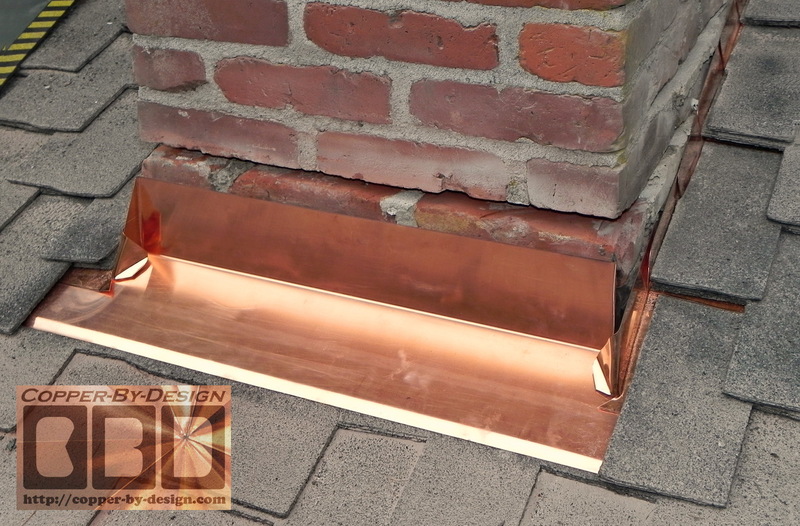 For a more permanent installation I would now have made this cap in copper in stead. 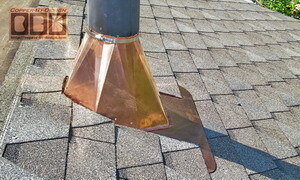 This chimney is only used for a gas vent, so high heat was not an issue.